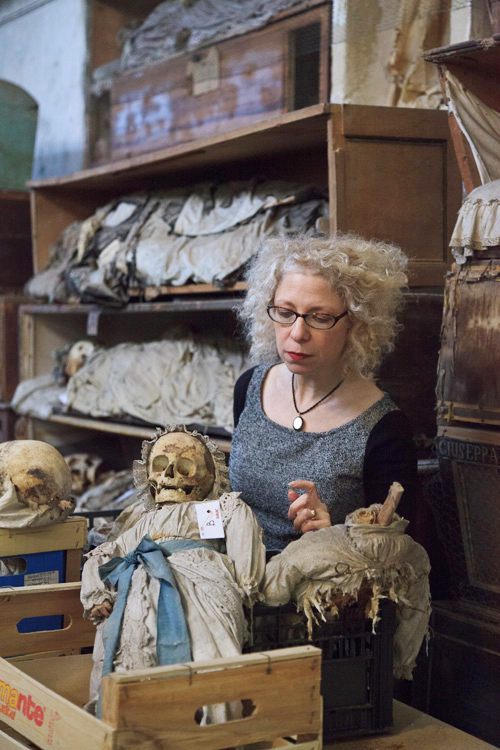 Below you will find a second guest post by Evan Michelson of TV's "Oddities" and the Morbid Anatomy Library which will document our three-week trip through Italy supporting our book-in-progress exploring the history of the preservation and display of the human body in Italy. Here, she waxes poetic on Palermo's rightfully renowned Capuchin Catacombs, best known to some as the final resting place of Rosalia Lombardo ("The Sleeping Beauty") and to others from Marco Lanza's The Living Dead. We were both more than happy to pay a sizable "photography fee" in order to have over two hours alone--all restriction gates opened, front doors locked to the public--in this dark, quiet, wonderful, overwhelming, sad, and, we both agreed, utterly perfect place. Above is a photo of Evan with her favorite--piece? specimen? artifact?--from a workroom in which the mummies are restored. Here, we were able to get close enough to touch stacks of mummies in dusty wooden coffins donned in rolling swaths of antique Sunday best, floral wreaths topping grinning skulls, hands folded demurely in white gloves. Not to mention a fully costumed child skeleton in a crate (see above) and the odd skull. More (many, many more!) images to come in the book, but we promised the keeper that we would restrain ourselves from online use. But let me say this: as those who have been will assure you, neither words nor photographs really suffice to communicate the grim magnificence of this place; A focus of both Evan and I's pilgrimage longings for decades, it not only did not disappoint but astounded. We both agreed it was the most spectacular, most overwhelming, most perfect macabre site we have have ever had the luck to experience. A few days ago Joanna and I visited the Capuchin Catacombs in Palermo; they have been an obsession of mine for many years - a grotesque dream. We had the whole place to ourselves for two hours, every gate unlocked, the doors shut behind us. In my imagination it had been only a few chambers, but the whole complex is actually quite large and it houses thousands of mummified corpses, all dressed in their finest; they are hung on the walls, laid out on crude wooden slabs and stuffed into elaborate coffins; they line corridors and adorn special chapels. To say that it was stunning and overwhelming would be an understatement - we were both giddy and disbelieving. There I was, in the place of my dreams; it was a profound experience that transcended every other deathly place I've ever visited. It was the clothing that did it, that and the somewhat crude method of mummification practiced by the monks. The result is mummies in every state of decay: some not much more than skeletons, others with their faces artfully peeling away; there are only a handful that are eerily well preserved. They all wear gorgeous linens, laces, silks and woolens, their feet in lovely shoes, their hands stuffed into dainty gloves. The effect is uncanny, fascinating and strangely personal. These are real people, their post-mortem body language a grotesque parody of life. Long after the muscles stiffen the skin continues to shrink, harden and slough away, giving rise to hideous and comical expressions alike. The stuffed, hanging bodies, obeying the call of gravity, slump and lean in intimate ways. This photo was taken in a disused restoration room - abandoned a while ago when the money ran out. The baby in the box is just one of many children brought here to spend some portion of eternity dressed in its Sunday best, welcoming curious strangers. You can find out more about the Palermo Capuchin Catacombs by clicking here. You can read future posts by Evan both on this blog and on her Facebook page, which you will find by clicking here. Top three images are Evan's; the rest are my own. Stay tuned for more posts from our new convent lair in Florence! Thanks for this post ladies. I am also obsessed with the Palermo catacombs and used it as a setting for one of my novels. It is awesomely creepy! I'm so looking forward to your book project - will you be setting up a list of people interested in buying? Also, I'm in London, so I hope to meet you at Tuesday club or any other events you might be holding. There's a Dissection exhibition at the Museum of London at the moment - hope you make it in time for that as there are some brilliant exhibits. I will be in London until Mid September--doing another residency at Last Tuesday Society in June and July, so hopefully we can meet there? Thanks for the kind words about the book; no pre-selling plans of yet, but stay tuned!